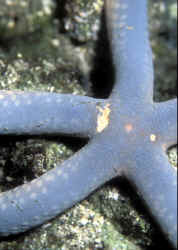 Linckia laevigata (Linnaeus 1758), Linckia Seastar. Blue and greenish. Also found in other colors, brown, tans, violet to burgundy, even mottled... And there are other species of the genus offered to the trade. This animal is very (95+ % IME) often doomed from the retailer to aquarists... having suffered too much damage and neglect in the process of collection, holding, shipping... Look for damage (ex. right) and avoid such obviously poor specimens. In the wild this is an algae, bacteria, detritus feeder... that needs space (hundreds of gallons) and mulm (muck, dirt, call it what you will, on the bottom of its system to survive. 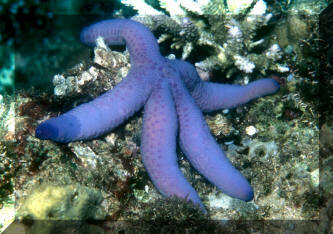 My advice, look to other genera, species of seastars. Linckia multifora (Lamarck 1816). Similar but smaller than L. laevigata and mottled red, blue and yellow colors... also a suspension, algal, microbial... feeder. Indo-Central Pacific; Red Sea, East Africa to Hawai'i. N. Sulawesi, and Nuka Hiva, Marquesas pix. A Purple "Linckia", Tamaria stria Gray 1840. Eastern Pacific; Baja to Columbia. 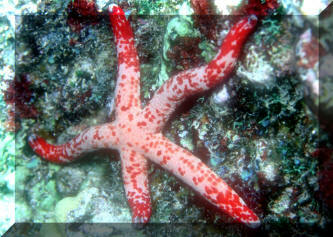 Need rock substrate for habitat, not over-zealously clean. Best kept one to a tank. Family Ophidiasteridae.